I was a little worried I wouldn't care for this soup especially with how strong the smell of peppers was while he was cooking it. In the end we both really liked it. The flavors were really great together & I especially liked the sweetness of the corn (we used MN sweet corn I froze this summer). Matt added a little extra hot sauce to his before eating while I added a scoop of yogurt, I liked the tanginess it added. Matt stuck pretty close to the original recipe though he added some water. In a large soup pot melt the butter over medium-high heat. Add the onions and peppers & cook until tender. Add the garlic, cumin, oregano, ancho chile powder and 1 cup of corn. Cover and cook for 5 minutes. Add 1 cup of water & puree in a blender or with an immersion blender. Add the remaining corn and the chicken stock. Mix the milk & masa together & add to the soup. Heat through. Serve with hot sauce & yogurt. This is officially on the list - I have a freezer full of blanched sweet corn from this summer! Making Chicken Tinga Tostadas for dinner tonight - wish I could send you guys some. 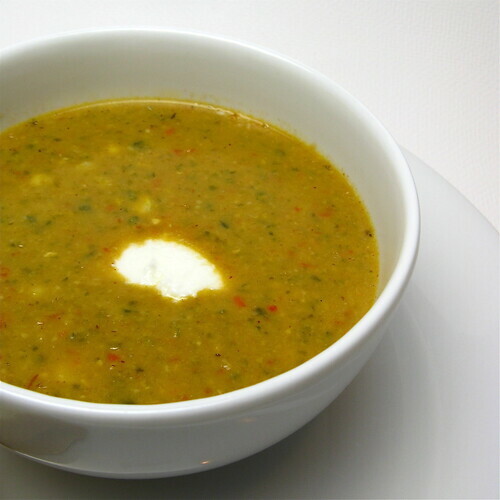 I make a similar soup without the cream, it's our favorite, garnished w/ cilantro! I love corn soups! My mom makes a killer corn cream soup that I miss so much. I need to ask her for the recipe. oh, now that's pretty! two of my favorite vegetables just so happen to be corn and peppers and i'm crazy about the look and potential deliciousness of this soup! Its funny, lately everytime I had some of our frozen sweet corn to soup, it comes out too sweet. No matter what I do- lemon, limes, tomatoes, I can not tame the sweetness. Any ideas?